This year’s Oscars I have to say were one of the best. 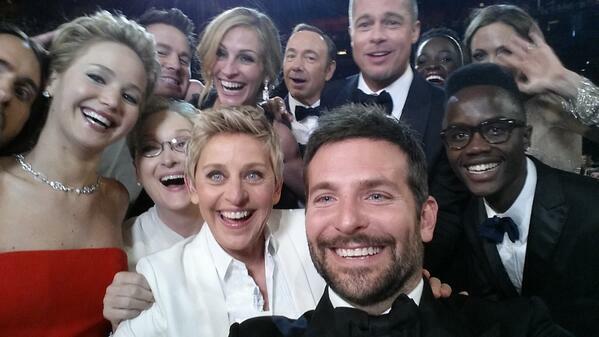 That was largely due to Ellen DeGeneres lively commentary and how she actually seemed to be having fun with the job. The show didn’t feel as stuffy and boring as it usually does. 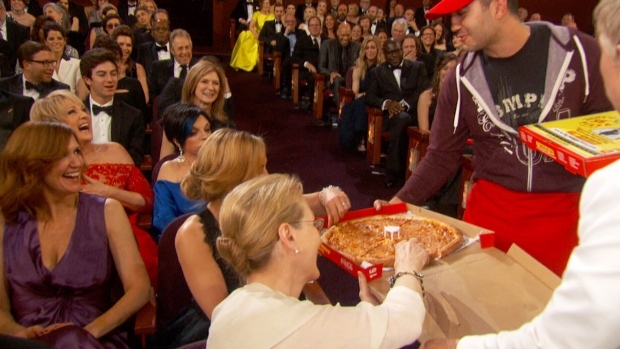 She tweeted images live, ordered pizza for everyone, literally and made the actors appear more comfortable than usual. I think this was so smart, today’s culture and young people especially live and die by social media, so putting this in the show was very smart of her. Here is a quick recap of what went down and was fun to watch. 1. Jared Leto won for Best Supporting Actor for Dallas Buyers Club… That hair and the speech to his mother sigh, it was so sweet. 2. 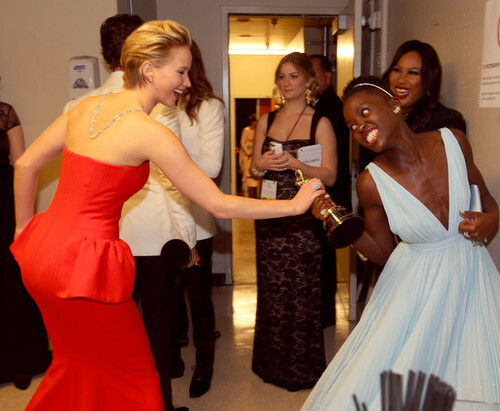 Lupita Nyong’o won Best Supporting Actress for 12 Years a Slave. Hell yes she deserved it and her speech was probably my favorite of the night. Also she got up and danced with Pharell when he sung “Happy,” how cool is that? 3. 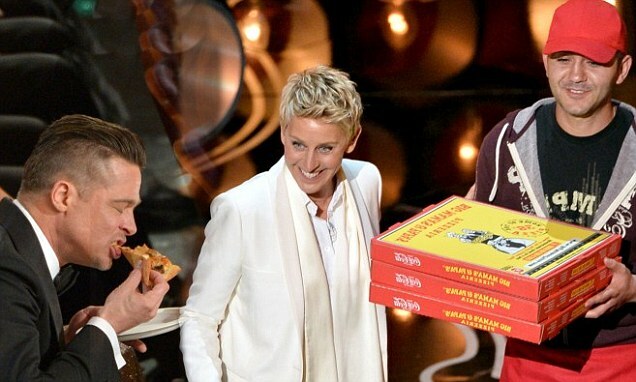 Ellen ordered pizza for everyone, yeah it really happened! 4. The selfies. This was probably the coolest part of the show when she asked a bunch of actors to gather around to take a group shot and asked everyone to retweet. 5. 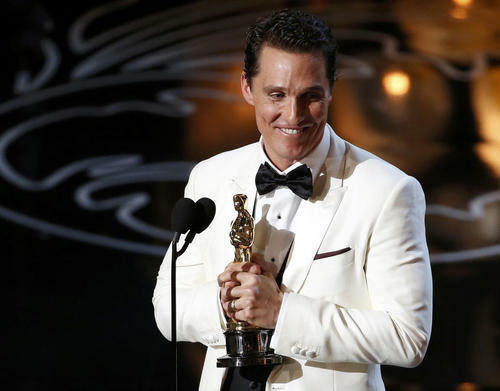 Matthew McConaughy won for Best Actor for Dallas Buyers Club. He gave a great speech and ended it with his famous catchphrase “all right, all right, all right.” Love him to quote my fellow bloggers, the McConaissance is in full effect now. 6. Leo won nothing boo sad 😦 Poor Leo at least he’s hot, so who cares right?! 7. 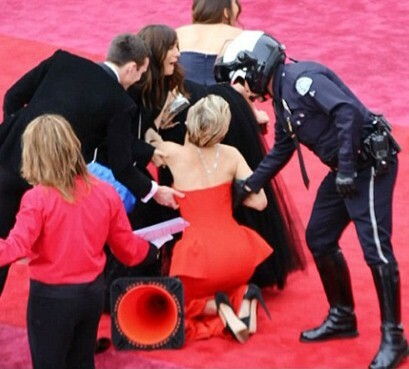 Jennifer Lawrence fell again, but we still love her. That dress, it was gorgeous and she is so fun and playful, she really is America’s sweetheart right now. 8. 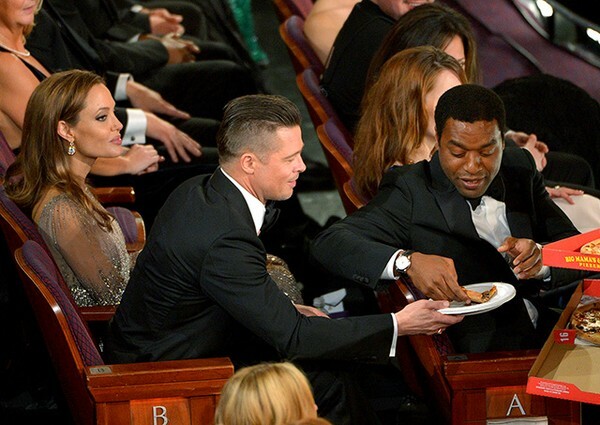 Brad Pitt though… he was all up in Ellen’s business and jumping into photos and helping hand out pizza. Funny! Chiwetal was hungry… Thanks Brad! 9. 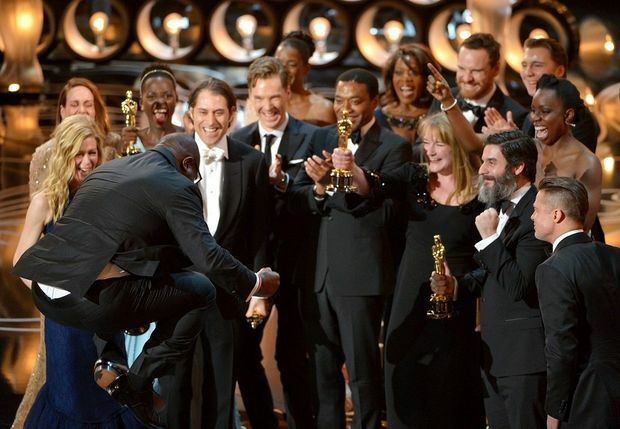 Steve McQueen’s reaction to winning Best Picture for 12 Years a Slave… HELL YES!!!!!!! 10. 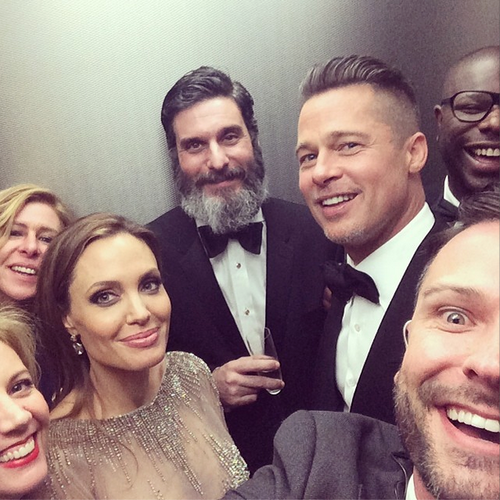 All the selfies floating around the net and photo bombs. Too cool I love seeing this type of stuff. So that was the Oscars and this was James Franco at home… not giving 2 fcks about it. LOL. This is the best Oscar related post I’ve seen!! And there’s bunch a shitload of them!!! Omg thank you! I’m glad that you liked it! Agreed, Eric. Great work, Melissa! Thank you ! You guys are too sweet! Awesome post. I feel like I actually bothered to watch it. Thank you! I’m glad you tuned in, I usually watch every year since I was really young and this one felt so different than the past. Hopefully it’s a new era! 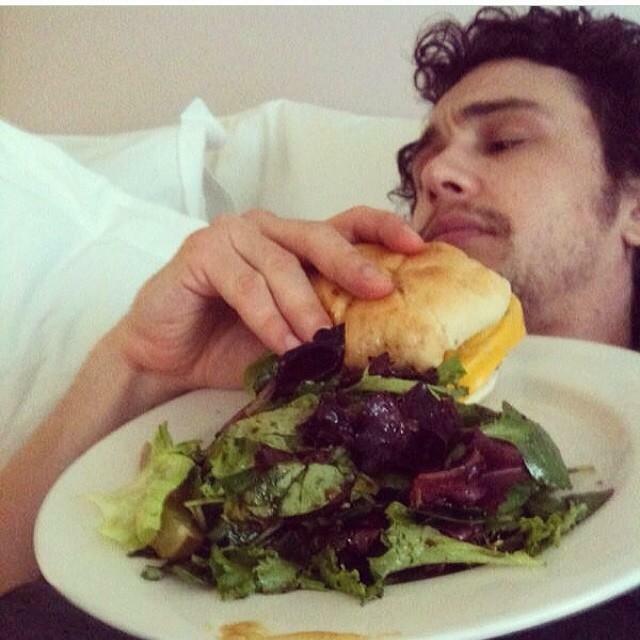 I identify with James Franco but is he eating a sponge? 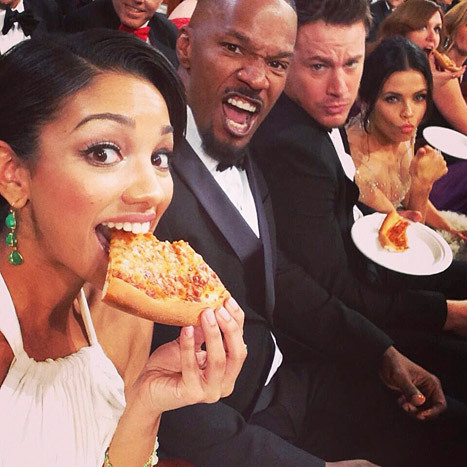 Great recap, the selfie was a great part. Great stuff Melissa! Love the photos. 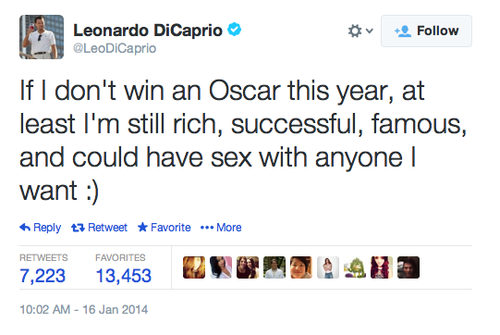 Poor Leo! But hey he still gets the chicks yeah baby! Great post. Did James Franco really just slob out at home instead of going to the awards? Haha! 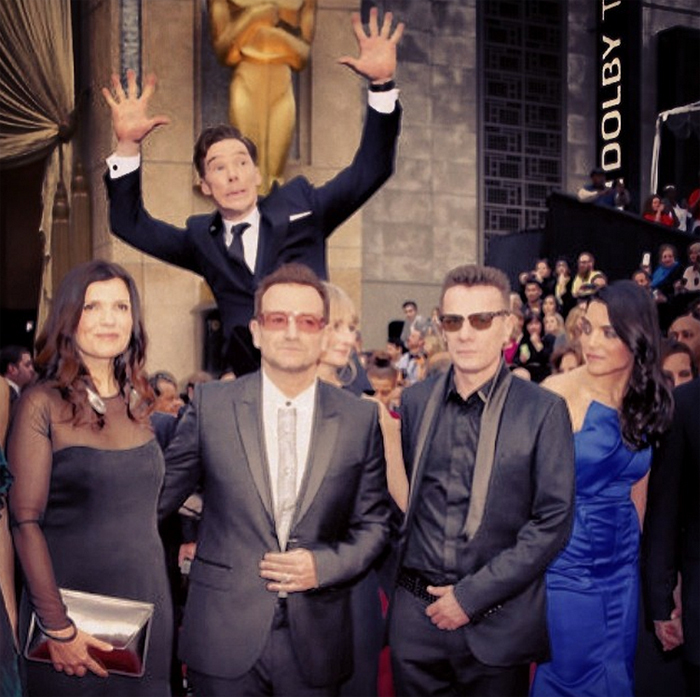 YUP he totally did, I believe he tweeted that while the Oscars was on. Prob because he got so much flack when he hosted and sucked at it. Poor James! LOOOOOOOOOOOOOOOOOOOL Melissa this was just beautiful, loved it!! Yeah Pizza Gate 2014 did elongate the show, but damn sometimes that show needs a little spice. As much as I love movies, it needs a little fun. Thanks for reading!! 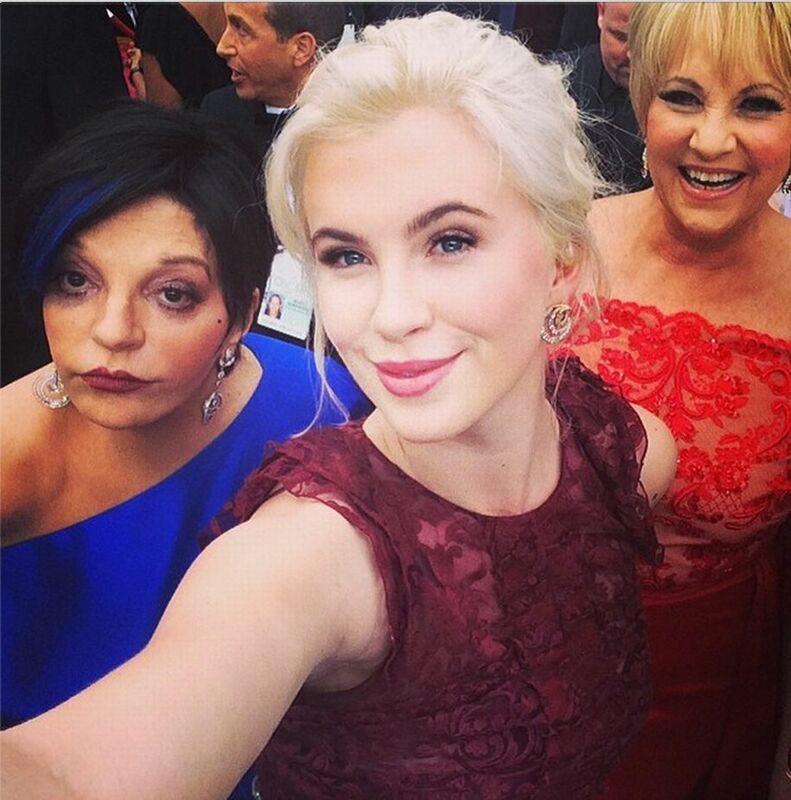 Wanna see the best Oscar recap of the year?? Check it out at SNAP CRACKLE WATCH! !